Paychex Flex is an all-in-one Payroll & HR solution that you can build on as your business grows or changes. Use it to run payroll and integrate your HR administration, retirement, and insurance management with service the way you want it and our expert knowledge of the regulations that could affect your business. Get 3 months of free payroll processing for a limited time. Click the link to get the details. 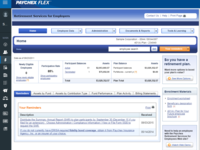 Paychex Flex Reviews Recently Reviewed! Comments: Overall, I have been very pleased with Paychex as a company and their online platform, Paychex Flex. I have the peace of mind that our payroll is in capable hands. Pros: It is easy to use and it gives me a peace of mind that our company's payroll is in capable hands. Their customer service is great. Each customer has a dedicated payroll specialist, so every time I have a question I am talking to the same person. Our payroll specialist has always been very helpful any time I have had weird situations or questions. Paychex withholds all the appropriate taxes for both the employee and employer and then files them when the appropriate government entities. Our business is located Ohio, which has a complex tax structure including both state and local taxes. Paychex has saved me so much time and stress. Cons: I wish that Paychex Flex tracked pay increases. That is the only thing that I liked better about our previous payroll provider. Our previous payroll provider had a tab that showed an employee's salary history and the date of each raise. Paychex Flex does not have this, so I have to track it separately. I wish they had a more intuitive reporting function. The standard payroll reports are laid out very well and are very easy to run, but if I need to run a report that it out of the ordinary, I usually end up calling my payroll specialist because I can't find the report. To be fair, the couple of times this has happened I have been looking for a report having to do with workers comp and since workers comp is run by a government entity in Ohio it has some added complexities. 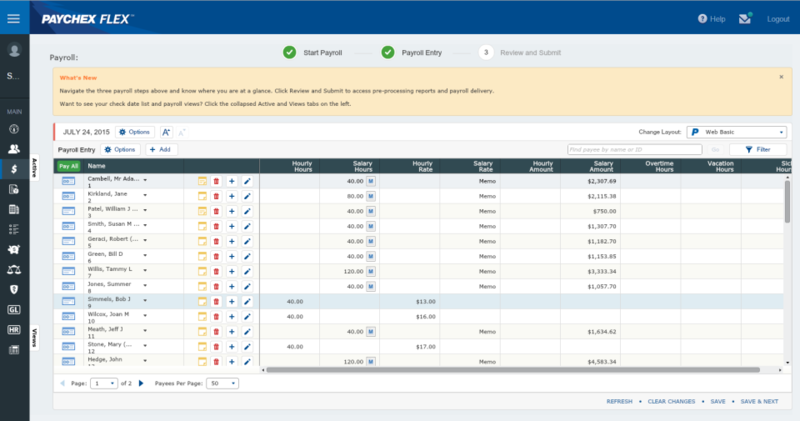 Pros: Paychex FLEX is easy to navigate, fast at loading reports and pages, and gives you access to what you need. As an accountant it is vital for me to be able to have access to the reports and items I need to get accounting and taxes done without having to jump through hoops to get that information. Many payroll firms make this task frustrating and time consuming. With Paychex FLEX I have one log in for all of my clients and can easily navigate to the company and reports that I need every month or at year-end within a few minutes (including the login process). Cons: One thing I don't like is that the default view for reports is set to the last 90 days. Many times, especially dealing with tax forms, I need reports that were created more than 90 days ago. Also, since the newest reports go to the top of the list you already have the most recent reports at the top. Why not default to the past year and then just let me filter down to a smaller group of reports if that's what I want? Other than that small gripe, they have done a lot to improve their FLEX format. When it was first released everyone hated it but it has finally been improved to the point that it is extremely usable. The problem is that it seems like every time they get things just right they move to a new platform and "upgrade" their systems. I understand that this might be a necessary evil but it sure does cause a lot of growing pains for the end-user. Overall: Payroll reports for my clients are at my fingertips! Paychex Flex the next best electronic payroll system! Pros: Paychex Flex is an online software that human resources personnel can utilize for payroll. Paychex Flex has various subscriptions that company's can select depending on the types of features. Paychex Flex offers an employee dashboard that requires an username, password, and pin number. Paychex Flex allows users to disburse amounts of funds to contractors, employees, vendors, and sponsors. Paychex Flex offers tools, tutorials, and customer support related to the online library and overall application. Cons: Paychex Flex requires a new verification code upon logging into the dashboard. Users listed in the Paychex Flex may not be deleted depending on administrative rights to complete such an action. Paychex Flex may provide usernames and passwords to administrators and not employees, thus employees may not be able to update time card electronically. Paychex Flex allows time card adjustments to be made by the administrator. 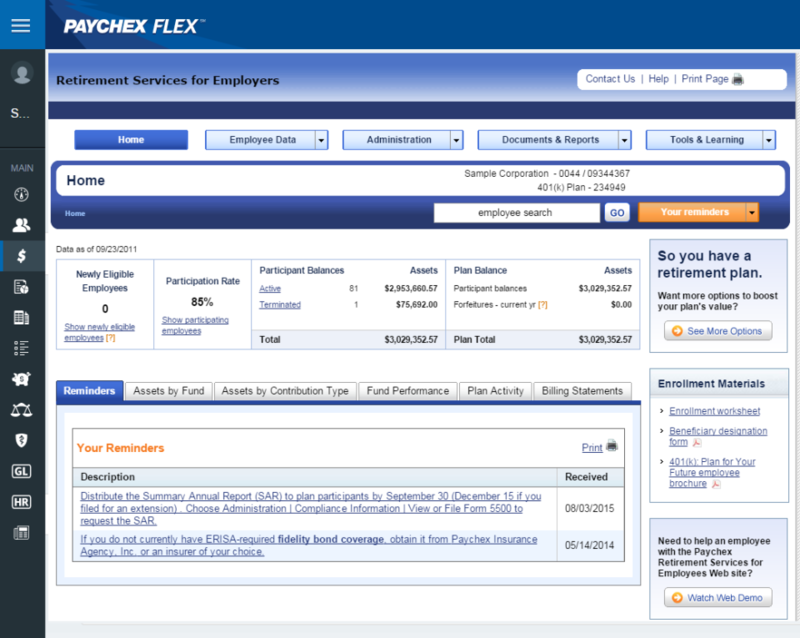 Paychex Flex allows payroll adjustments to be made by the administrator. Overall: The benefits of using Paychex Flex software is that the product is available online to users. Other benefits include being able to select a specific payment plan or subscription suitable for the company to aid the human resources aspects of payroll. Additional benefits include accessing a dashboard with all employee information to be edited or submitted at once. More benefits of utilizing Paychex Flex include developing quick reports such as payroll statistics. Paychex Flex is a good tool to administer payroll for your company. Paychex Flex is a robust payroll solution that can accommodate almost any payroll need. Pros: Together with the company's team of payroll specialists, Paychex Flex is an effective payroll solution for small and large companies alike. As administrator for a small company, I appreciate having permissions to manage my company's staff in the tool while allowing the payroll specialist from Paychex to key in the biweekly payroll data. This delegation of duties gives me control over the the job functions that are most important to me. The General Ledger integration with QuickBooks Online is configurable and works well once set up to meet your business needs. The 3rd party integrator's staff is professional and diaplays an expert knowledge of both Paychex Flex and Quickbooks. What I like most about Paychex Flex is that our tax returns and payments at the Federal level and for most states are done for us automatically. Cons: The browser interface is unattractive and not always self explanatory. The client id, which is needed on all email correspondence with your payroll specialist and is displayed on the banner at the top of the screen, cannot be copied and pasted into emails. The filter feature on the Person screen doesn't work consistently, and I frequently have to reapply the same filter so that only active staff appear. Online help for the software can be misleading or inaccurate. After following instructions for 1) giving access to staff and 2) adding a new state for withholdings, without success, I learned from my payroll specialist that I didn't have the ability to perform either task through the software. Pros: The best thing about this software is that I can do everything I need to do on my computer or mobile phone at any time of the day or night. The application is very easy to access and I administer payroll, 401k, health, dental and vision benefits, FSA and employee additions/changes over the application. Almost every service I utilize through Paychex is on this application. Invaluable! If I'm out of town I can still submit payroll! WOW! What a game changer Paychex Flex has been! The old way of doing business is out the window with Paychex Flex replacing it in a very positive way! Cons: There is a couple of items that I would like to see enhanced. In people, I would like the ability to always pull up my preferred view of employees without having to click on the apply button. My preferred view is saved but will not display until I click on apply. Second, on the people drop down menu from the upper right corner, I would like the ability to select that view as well. When that drop down is selected I get all the employees that have ever been entered into the Paychex database - terminated and active. I want to be able to display just the active employees in that drop down. These are just enhancement requests that in no way affect the valuable pros of the application. The items in the cons are just "nice to haves". Overall: Survey software is not something that I usually recommend. A great asset to have when running and business. Pros: The software itself allows me to eliminate the need for a time clock for my employees. They are able to have the app installed on their company issued smartphones and log in with their fingerprint access on the phone (which the app supports) and can clock into work in no time. They also have the availability to request time off, check vacation, sick and personal balances, view pay stubs and a ton of other features geared toward self help for the employee. This software saves me money so that I do not have to pay someone to sit and calculate all of the different times and payroll sheets. I would be lost without Paychex Flex. Cons: The app can be a little slow at times. They also schedule down time on the overnight hours until 530am when most of our work does begin before that. It is a simple fix as I can enter staffs time manually when needed. You also need to trust your employees to punch in and out when they actually show up to a job site and not while driving home. Pros: Paychex has been top-notch for over five years, when I switched to them from another payroll company. I operate a small seasonal business with about 10 employees, and from the beginning I have received all the support that I need for my payroll and tax responsibilities, and at a more reasonable rate than I was paying before. I deal with one single payroll specialist every week (unless she is on vacation or something), which I love, and if she is unavailable the fill-in specialists have been able to take care of my payroll, which is not quite standard, without any issues. The website took a little getting used to initially, but I download my reports from there every week, quarter, and year, and everything is easy to find and use. I couldn't recommend Paychex more highly, at least for any business such as mine. Cons: If anything, I feel that it would be good to consider a website review and edit - I do not have anything specific to offer in terms of what to change, but it did seem a little confusing the first few times using it. I don't have any issues now, but admittedly I only log on to do the same thing (download the report) each week, quarter, and year. I have worked with Paychex for HR and Payroll purposes. Pros: The user friendly approach within the Employee Online Access. We had employees that were afraid to go paperless with pay statements but with a little training everyone began utilizing the system. I liked the time and attendance module which allowed employees to see their own timesheets and administratiors to make corrections/update their staff timesheets and approve prior to payroll processing. Cons: I disliked the fact that the payroll module didn't link directly with time and attendance, we had thought that what was done in time and attendance regarding time off balances would automatically feed to payroll and reflect on our employees pay statements. But we found out that we had to do adjustments in both windows to ensure it matched. Overall: We were able to reduce storage of paper statements that were never picked up. We were able to increase employee morale by giving our employees the ability to see their own data and make time off requests on their own. Pros: I like that their Flex software is "live" and you no longer need to transmit hours as a file. Cons: New features are released with glitches, representatives are NEVER available, it takes a lot of follow-up to get assistance and they pass you from representative to representative like a "hot potato". Overall: We transferred over from Preview to Flex in March and have had some sort of issue (always a new problem) with running payroll from glitches, to inaccuracies in accruals due to incomplete data transfers to random errors like pay rates suddenly not being mapped to the proper pay components. Overall Paychex has great features and I love that our employees are offered the option to view their stubs and w-2s online and request time off but, I feel like they need to train their employees more on their updates and work out the kinks before they release updates because it causes a lot of unexpected error on the user end which cause a delay and inconvenisnce on our end. Pros: I do like how the website is laid out and how easy it is to run reports, set up new employees, and enter in payroll. In general the reps are helpful and you dont always have to talk to just your assigned rep to get answers. Cons: When there is a tax problem, the only person you can talk to is your rep, who general doesn't know anything about taxes and can only pass the question onto the tax department. Once you ask the question, it can a few weeks before you even hear back from someone about the status of your questions. It gets put into a queue and you are not told if or when it will get answered. This is very frustrating when it comes to time sensitive tax issues. PREVIEW was a great payroll work horse. But beware, FLEX Payroll is no PREVIEW. Comments: We've been on Paychex PREVIEW payroll software for 16 years. It was a solid no non-sense payroll processing work horse which came with everything you'd ever need to process payroll for 100+ employees in a very quick and efficient manner. PREVIEW software was extremely well designed and well thought out. The developers took the perspective of payroll processing users and provided all the navigation speed, functionalities and reports that we'd ever find useful or need to do our jobs quickly and efficiently. There were hardly any unnecessary clicks, keystrokes or scrolling to speak of. It exceeded my expectation all these years. Paychex's golden era and reputation as payroll processing leader was probably due to these sensible legacy products. Like all good things which must come to an end, we were switched to FLEX Q2 of 2016 because PREVIEW was so old that Paychex decided to sun set it this year - which was totally understandable. But any reasonable PREVIEW clients would also expect and assume that whatever good features, good functionalities and useful reports that were available and had been working well in PREVIEW would be brought over and be available in the new payroll product as well. Not so. Enters FLEX which Paychex touted as being technologically advanced, etc. It probably is. But as far as FLEX payroll processing features and functionalities are concerned, I am actually set back 16 years to a payroll processing product that seemed Beta, very slow, cumbersome, awkward - compared to PREVIEW. 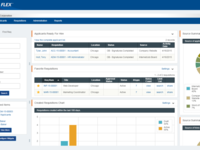 Paychex simply threw PREVIEW out the window and started fresh from scratch with FLEX. I spent my first several months on FLEX Payroll sending them suggestions to make FLEX "better". I don't know if anyone cared. 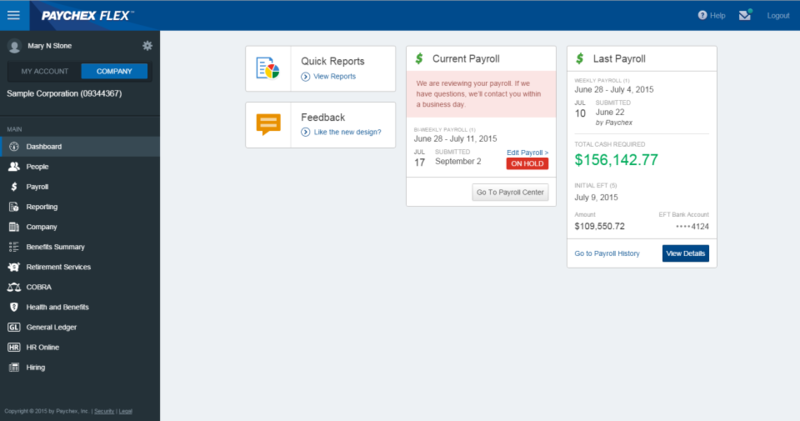 FLEX Payroll screen designs and navigation are very slow, very cumbersome, and very awkward. What I considered "speed features" in PREVIEW were non-existent in FLEX. Fields are spread out as far apart as they can find room to spread them out to (instead of keeping the screen layouts compact) seemingly so as to "maximize" unnecessary clicks, scrolls and keystrokes as much as possible. It's also more cumbersome and time consuming just to get information and reports from FLEX Payroll which could be run quickly and easily before in PREVIEW. I felt like I'm using payroll software designed by inexperienced college graduates who had never processed payroll before in their lives. They're out to get as much of my time make me do as much work as possible for the same amount of work that I have to do as before - to see where my breaking point is. So overall, I'm not impressed. To me, if the basic payroll processing functionalities are less than before, FLEX Payroll will still be inadequate despite all other "great features and modules" they added to FLEX which I don't need. Pros: Flex integration with Benefits Administration (Benetrac) module can make life a lot easier for some - but Beware - only if your group is 100+ enrolled. Our Paychex sales rep did make the claim that with Benetrac service, our medical insurance transactions "will all be automatic with carriers and we wouldn't have to do a thing" - which was totally not true. As it turned out, more carriers than not do not do EDI for groups (company) with < 100 enrolled. So the main FLEX selling point totally didn't even pan out for us. Please learn from our lesson. Do verify specifically that your medical and dental carriers will do EDI for your group before signing up for Benetrac. Cons: Although FLEX does its job as payroll software, having been on a faster and more efficient product before, we know how much more time we are spending on this "more inefficient" product compared to before. Oh and please save yourself the headaches and trouble by passing on other Paychex's services. We tried Paychex Health Insurance and ACA filing. They both failed miserably. Same story in both cases. Can't get hold of the account rep and customer service rep. No one would answer or return our calls. Last year's ACA were 60% wrong after I've redone and resubmitted data 3 different times after 3 different CSR told me 3 different things. They were just making it up as they went. Very frustrating. Recommendations to other buyers: Thoroughly test drive FLEX and any other competing products before you sign. The devil really is in the details. FLEX does have features which PREVIEW didn't have. But as far as payroll processing goes, you might find many FLEX payroll features surprisingly slow, clungy and inefficient. Take your time to check them out. In summary, Paychex isn't the payroll company nor payroll products they used to be. Do not assume that every product offered will be good and will work out. Pros: As both a Paychex user and admin, I love how easy it is to navigate, you feel that your information is secure and if you experience an issue there is very short wait when calling customer services (typically no wait at all). When you first log into paychex, there are multiple security levels that one has to pass depending on your preference. Also, once you are in there is a dashboard with shortcuts to all the most used features. Paychex is constantly improving their software which is exciting. Our company is really enjoying the new live reports that update on a daily basis calculating everything from turnover rate, average headcount, and hired & termed totals. Cons: We really enjoy using this software, there is nothing we dislike at the moment. Pros: I can easily clock in and out of my Paychex account on any device - super convenient when on the road or working remote. I can also find my W2, tax and benefit information in one place which makes my life easier around tax refund season. I can easily punch in vacation time and forward it to my HR person. Cons: Sometimes it doesn't register the clock in on the first try but selecting it twice will allow me to. The interface allows you to Break In and Clock out even if you never Clocked in which is odd, but HR can easily fix any mistakes. Overall: Easy to keep track of employees, vacation and benefits - all in one hub for employee information! 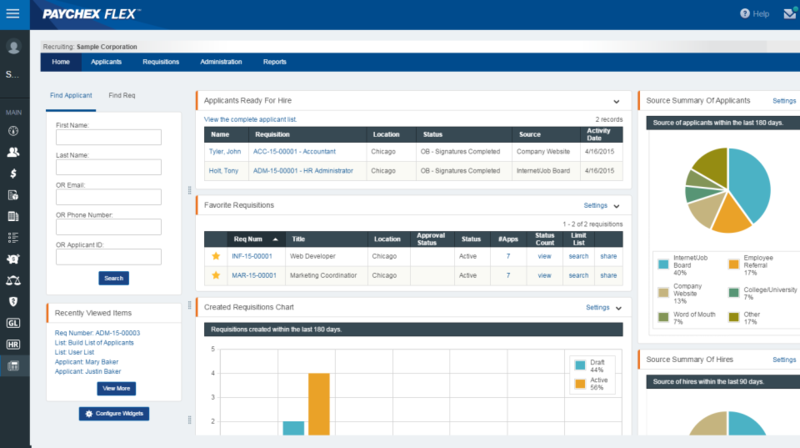 Paychex flex is so easy to use. Pros: This software is so easy to use. It gives you tutorials if you get stumped on how to do something. It also has the capability to put all your reports in one place so when you need to run a report, it is all there waiting to be downloaded. Cons: The only thing I really do not like with the system is that you have to go thru so many prompts to log in and then you have to have a specific code sent to your phone in order to get into the system. Needs to be a simpler way that allows the protection. Overall: Everything you need is in the system and best of all accurate. Pros: Payroll specialists are very good and on top of their game. Easy to use from anywhere, never down, easy to get reports any time, easy to add in deductions or bonuses, customizable in general. Cons: If I make a mistake, then go back to fix it, for some reason twice now it would not take my edits and I had to call to fix it, really annoying, I hadn't submitted yet. Tax questions/DOL questions - you have to wait until they get back to you, no way to know when they will, who is working on it, etc. Every change needs to have an accompanying form sent in. Very annoying, So if I change it, I have to fill out a form, print it, sign it, scan it back and send it, for every little change. Change an address, form, change a rate of pay, form, change a bank account, form, someone leaves for 6 weeks medical, form out and form back - you get the drift. Overall: Easy, consistent payroll service. Inter-department communication could use some work. Comments: Procured the total HRO package (payroll, 401k, FSA, Time & Attendance, HRIS, HR Compliance and HR Generalist). There is no HRIS compatibility with the Payroll system, one has to run separate reports. Anytime Paychex updates their website, links do not work to the other features and or issues occur. Example, PTO accrual stopped working properly so we had to start accruing PTO manually and users not properly redirected to their links in the Learning center. On the payroll side the support is a black hole. Specifically any state registrations that are not properly loaded by Paychex and result in state tax fees which do not get resolved without employer paying penalty. Numerous emails do not get acknowledged. The implementation process is juvenile and lacks complete project management scope. Overall communication and execution by Paychex is so poor, one finally stops being frustrated and simply begins search for better system, which we are doing. Pros: Compliance. Nice to have employee handbook online and learning center for compliance training is also helpful. While Paychex payroll has strong workflow rules and meets general processing requirements, they make everything else so painful, therefore one could never recommend them. It would be like telling someone it's okay to cross a bridge that you know could collapse any moment and that you know is no longer maintained. Cons: Assigned customer reps - unresponsive or not timely in responses until escalations. Paychex's lack of technology understanding - every time they upgrade they do not test what the impact to customer use and all their products. They had a big upgrade in late December 2015, their system was not accessible from early morning until the evening (end of year!). Multiple email and calls yielded no information. Finally at 4pm we get an email that they were experiencing problems and would be back live shortly. Who does that? While learning center is a nice to have, spent an hour giving feedback and nothing changed, e.g., the CA Manager Anti- Sexual harassment training is 2.5 hours all in one shot. Not standard for training needs - asked them to break into 4 modules so it would not be daunting to busy leaders....crickets. Recommendations to other buyers: Stay away! Pros: Ease of use: Manager login allows user to view and edit timecards of employees. Correct errors made by employees and finalize timecards for payroll. Layout of website is very user friendly and easy to find what is needed. Cons: The scroll of "Clock In" through "Clock Out" should not have moving icons, as it causes some employees to click the incorrect punch. Overall: Paychex Flex allows our company to finalize payroll easily for our weekly checks. Employees are able to view their paystubs the day before the check hits. Discrepancies are easily solved. I find Paychex Flex very easy to use. The app is great and very convenient. Pros: The ability to use the system from my smart phone is amazing. Just before I left for vacation I changed my deduction, unfortunately due to user error I had them deduct too much money from my pay check leaving me with a lot less than I expected. In a different environment I would have had to wait until I returned home the change the setting and therefore leaving my next paycheck with the same deduction. With the app I was able to adjust the deduction properly and my next check was the amount I was expecting. Cons: The feature to submit you time off is missing an important function. It does not give the user the ability to see what has been requested until the request has been approved. It's very inconvenient for someone who's manager isn't monitoring the queue on a daily basis to approve their requests. Overall: I love the ability to access my paychecks remotely as well as change my deductions at my convenience. Comments: Help save me money on my payroll fees, which is getting a bit much for only 3 employees soon to be only 2. I think I could get others to use Paychex but they freak out when I tell them how much is the payroll fee is. Cons: Pricing on payroll keeps going up and up every year. I tried getting my employees monthly to save money but they said they would quit. :( There should be a better invoice charge for less than 5 employees cuz in 2 weeks I will only have 2 employees and will be paying the same for invoice charge. And one other big thing is that for the last 5 payrolls I HAVE TO CALL IN. This is getting frustrating cuz all the specialist says is that is his too busy and paychex is short handed to call ALL clients. REALLY?? I pay and have to remember to call my 3 lonely number in. Because of these 2 major things, I am starting to consider calling ADP to see how much their fees are. I am a small women disabled business. So I need what any money I can. I really love Paychex it is just these 2 major things that might make me switch companies. Pros: My favorite aspect of this software was the visability of all my employees on one screen. I could adjust time from same screen and double click to get into the detailed information about an employee. You could set up schedules and with the linking of the fingerprint clock it worked perfectly. Cons: Manually change times unless you wanted the clock in and out times to be static otherwise you could create a behind the scene scenario for punches. Overall: User friendly and easy to manage for specific needs. Comments: We were with Paychex, left for what sounded like a more promising system (terrible move), and came right back to Paychex! They are continually improving the product features and functions and we have been very pleased with the services! Pros: Paychex has become a great all-in-one solution for our HR and Payroll needs. Onboarding, Payroll, Benefits, Human Resources... the system has greatly helped us streamline our processes! Dedicated account representatives that are very prompt/responsive. Cons: Sometimes tricky to use the system when a Paychex rep is also in the account, or if system updates occur during business hours. Custom reports can be a little complicated. Paychex has been an excellent option for our small non-profit! Pros: I run a small non-profit in education and paychex has been so perfect for us. I don't have a accounting or CPA type background so I was intimidated at frist with having to manage payroll, send out W2's and other tax documents. But Paychex made it SO EASY for me! They even auto sent all the W2's! Customer service is always excellent and I always get a hold of someone quickly. I HIGHLY recomend Paychex! Cons: The only issue I have ever had I even hesitate to call an issue. My company was in the approvial phase for our non-profit status and because we did not have our official 501(c)3 Paychex was taking out taxes that we should not had to have paid. But when we got our official status as a non-prof Paychex paid us back retroactively for the year. They couldn't refund any thing from the previous year though so that was a bit of a bummer. Overall: They do everything for you from making sure your employee's receive their W2's to generating amazing reports. I HIGHLY recommend Paychex! Comments: Too much turnover in the dedicated payroll specialist role. I think I've had four or five in the last five years, and transition experience has been mixed. Some great, some not good at all. Pros: Ease of use, cost effective. Traditional version easy to use and fairly intuitive. Not looking forward to the new release based on what I have seen so far. Cons: Inconsistent response time from the dedicated payroll specialist depending on which one we are referring to. See comment below. Pros: Recently, I've been shopping other vendors for alternatives. There are two things that Paychex does that other vendors seem to fail to deliver. One is the Washington State L&I taxes, the other is good integration with our 401k through Fidelity. For a small company, where I am doing all the HR, IT, compliance, and client service, being able to wrap all of these things together and still get an extremely competitive price has been a key driver in us sticking with them. Cons: Sometimes, the customer service can be inconsistent. If something goes sideways, this can be difficult. It doesn't effect 95% of what we do. Additionally, if you have unusual entries for payroll, it can be difficult to figure out how to enter something properly. The help menus are not that great. However, if you call them up, they are good about walking you through what you need to do. Recommendations to other buyers: There are customizable packages that can really help you with keeping the monthly costs down. Be sure to really evaluate what exactly you need. Pros: I like that my employees can clock in and out online (Time & Attendance) and that it merges right into payroll. Also my employees request their PTO online (no paper anymore)! Paychex has saved me at least 3-4 hours of doing payroll. I also love the Online HR Library which answers all my questions and also has samples of forms that I can use. Reports are great! Cons: Getting use to the new version that just came out after being on the old since we started. Overall: My overall experience - Paychex has saved me time doing payroll! I would recommend to anyone looking for a payroll system. Pros: Paychex is a robust payroll platform that will meet any payroll needs you have. The system is flexible, and can handle any nuances to your payroll with relative ease. I am also a big fan of the mobile app, which I sometimes find easier to navigate than the web based application. The employee facing interface is also easy to use. Cons: The interface for actually processing payroll isn't the most intuitive. There is a lot of saving involved, and it's easy to lose your work if you don't remember to do so throughout the process of running your payroll. Pros: The options available to me as an employee for this product are great. I'm able to track all my working hours, vacation hours, and sick leave hours in one place. If you used this product with previous employers and contact customer service for assistance, you have to help them sift through your potential logins until you get to the right one, should you need assistance. The customer service department can then help you disable to additional logins, if needed, to help with the process in the future. Cons: You can lock yourself out of your account easily. Granted, the user error is real. Thankfully, their customer service department is awesome. Overall: I'm very happy that my company uses this product. It makes it easy to check where I stand with my hours each week. Lot's of options, but. . .
Pros: Almost everything can be completed by the user online or in the app, which employees like. Cons: Paychex wants you to use the online platform only and does not want to have a person help you navigate the website. they want you to follow the video learning. Overall: As an administrator I have struggled with fully understanding some of the functionality. Again, Paychex staff does not want to help you navigate or understand. As an employee, I think it's great! Pros: Paychex Flex had great customer service, helping us with all of our questions as we continued to grow. 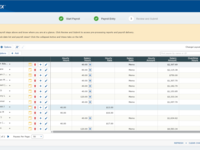 Cons: We found we were outgrowing the platform, Paychex Flex had limitations on how it could automate our reports and provide us the details we really needed. Overall: As a small business, they were a great start for our general needs. Once we passed a threshold of what we were looking for, they worked with us to transition to a more robust platform. Comments: Paychex Flex is useful for any size organization. If your company utilizes a 401k, the process is of setting this up is seamless. Flex plans, etc. are also very easy using Paychex Flex. Pros: Customer service is very good during implementation. The Paychex representatives assist new users along the way, and provide many ways to train. The have live training, and other training modules Payroll Administrators have access to. Cons: Once your company has launched with their system, customer service is a bit challenging. This can become a bit stressful If you have payroll emergencies. Pros: Easy to use. I can navigate from benefits to payroll to retirement very easily. I can also find out answers to employees questions with out having to call Paychex. It is user friendly for both companies and employees. Cons: I do find that trying to find different reports can be a little bit challenging sometimes. When you create your own report it takes some time. Could be quicker. Pros: I like the simplistic look, which makes it easy to navigate. Cons: As a user of the software, I'm not sure if this is an issue that can be resolved in the settings or if this is just how it works, but the biggest con I can think of is that it logs you out after 25 minutes of inactivity. My break is 30 minutes and I wish it didn't sign me out during that time. Overall: It easy to use and simple. switched from ADP and never looked back!Cust.Service reps are the best! Pros: It is very convenient to be able to log in any time and perform tasks when it's the best time for me. I frequently work remotely and am easily able to access the website from any computer with internet access. Cons: I wish the program would let me stay logged in longer with no activity because it takes a while to go back through the 4 step log in to get back into the software. Very user friendly software. The dashboard is easy to navigate to all aspects. Pros: Everything is just a click or drop down menu away. A library of past reports, whether it be a W2, tax return, or check stub, are all available to you in the reports section. I work for a business that has several separate companies under one parent company. I have one login to gain access to all the reports I would ever need when an employee comes in with a concern. It is actually quicker to login and get what I need rather than thumbing through file cabinets. Cons: Everything is internet server based..... no go around that. Having a business in a remote area, you don't always have the best internet connection. Every once in a while my system will hang while trying to download some larger reports. Pros: Very easy to view clocked in users, people on break, etc. As a manager it is easy to view and approve hours. It allows for a convienant way for staff to access paystubs and documentation. Cons: Employees often have trouble with the site when punching in/out - the easiest to access option are buttons that move, and as a result it is easy to click the wrong button! Way more time clock corrections that we used to get. It is very difficult for staff to tell how much vacation time they have remiaining, they constantly have to ask for confirmation - very frustrating. It isn't always easy to tell that as a manager either, so we have had issues where people took more time than allocated. THE most frustrating aspect of it is when someone misses a punch - sometimes adding a missed punch is just a matter of clicking a box and filling in the correct time, other times switching a type of punch - like from start break to start meal is ridiculous and you can end up with a big mess. Have never seen a program that is so irritating to handle corrections like that. As a manager I hate working with this program. Overall: Typical clock in/out and benefit tracking. Pros: I work in public accounting and It did what we needed it to do. We used it just to log our hours. We did not use it to log billable bourse. I wish we did in fact see what all the capabilities it had to offer! Overall: Moderate. It was good for what we needed it for. 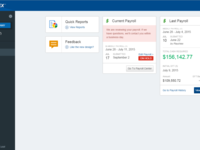 Pros: The Paychex interface is easy to use and really self explanatory. For something as complex as payroll, it could be easy to make things more complicated than they need to be. But as an end user, Paychex is great because it gives me all the information I need in a condensed & understandable format. Cons: As an employee, I have yet to find anything to dislike about Paychex. I can't speak for our administrator/person in charge of payroll, but as far as I know it's a great experience all around. Overall: My experience with Paychex has been top notch. I use their mobile app to see my paychecks when they come in, as well as monitor my 401k performance and adjust my contributions. And at the end of the year, they provide me all of my W2 information for tax filing. Pros: Pyachex software has been very helpful in managing our hourly employees time clocks and payroll. It allows us to ensure that we have everyone clocking in on-time and we are withholding the proper amount from each paycheck. Cons: The sales representative for our software is not very easily accessible and it takes a little bit of time to get in touch with them. Pros: I like that I can see all my paperwork and info for multiple jobs with one login. I have 2 jobs so I can see both paystubs/w-2s/etc all in one place which I like. Plus, my 401k information and my FSA is all done through paychex flex so its nice to have it in one place. Cons: I feel like the interface is a little hard to maneuver. I know we have a lot of capabilities but I have no idea how to use them. Getting to my 401k and trying to change/analyze it is a little hard and I am a pretty tech savy person. Pros: I like how paychex keeps track of all my vacation hours and how it sends reminders whenwe have to approve our time. its fairly easy to use. Cons: I feel like paychex seems to run super slow on most days. It sometimes takes me 2 to 3 minutes or more to sign on and after i punch it takes extra time for it to allow me to save it. the slowness is my biggest issue. Pros: It's very easy to use and not complicated like another system. They also have a lot of useful features and custom reporting that I use a lot. Cons: They kept changing customer service representative. I've has some good ones but some are not trained. Also, when they are out, they leave me hanging. No back up and I have to call general 1800 customer service. Pros: Paychex is affordable if using the basic features of operating payroll. The web features are simple and requires a two step log-in verification process for extra security. Cons: Paychex caters to small business and may assigned you a local expert as your point-of-contact. Not all times this person may be available when needed. In addition, Paychex wants to ensure the product is used correctly... However, this may require needing permission to make changes to your payroll features such as changing dates, company info, and etc. Some people may enjoy the benefits of having extra security when logging in, but after a while it can delay things having to keep verifying yourself and your computer just because a change in IP on the network happens. Paychex also charge a premium on next-day processing for payroll. Overall: Our company is currently using Paychex Flex to process payroll, issues reports, and process paystubs for employees. Pros: I find the software to be user friendly. Cons: The recent updates have more cons than pros, especially when the you first log in. Overall: When I first started using paychex flex I had no complaints but now just to clock in (when you're already in a hurry) it feels like a game of pin the tail on the donkey every time because the icon to click on changes location on the screen every time the program opens up. One of the best payroll services. If you are looking for convenience this is it! Pros: I love being able to have access to my payroll at anytime. Not only do you have access to your time sheet but you have access to your paycheck stubs, request time off, and tax information. Cons: Paychex Flex tends to have a lot of bugs with the site. You can frequently get error messages, or the webpage times out. One of the worst experiences I have had with Paychex is the program not recognizing punches. Which can be detrimental for employee's whose metrics are based off of attendance. Pros: The system is always up to date and ahead of the game on advancing technology. It is easy to use, and customer service is always a priority for anything you don't understand. Cons: Learning how to use the system initially can be difficult if you aren't able to work closely with a customer service agent, or attend a training course. Paychex is a one stop all inclusive payroll and HR package. Pros: If you have multiple locations, this is the best way to track attendance etc. Tracks time off request for all staff levels. Ability to store HR documents for staff members online. Cons: Downtime or system issue that cause clock in/out staff problems. Entering payroll is a bit of a challenge. Overall: Saves lots of time when completing payroll. Pros: For simple data entry and payroll this software is easy breezy. Cons: When getting into reports or anything that you have not done before the help button is either just a jpeg or the program doesn;t work in Chrome. I haven't tried it in another browswer. They recently rolled out new a software upgrade that is unusable because the buttons are grayed out and the tech support acknowledged that. Their saving grace is that the tech support is pretty good as long as you get them within business hours. Overall: Working with Paycheck and doing only essentially data entry and payroll is usually very enjoyable. Mostly positive things to say about tech support. We don't use this for keeping our timecards so I manually input our hours and checks. Pros: Extremely easy to use. Offers a variety of reports. Our company was able to go paperless with Paychex by allowing our employees to view their paystubs and tax forms on the phone app. If you call the customer service main line, you can usually get through to someone quickly. If your Account Rep is not available, you can get general assistance from another Customer Service Rep.
Cons: I can't think of anything I would change about the software itself, but we are not happy with our assigned Account Rep with Paychex. There have been multiple errors to that could have been avoided if she had more attention to detail. Overall: Simple and detailed reports, easy payroll submission, paperless payroll.